A few years ago, I featured film of Norton Motorbikes whizzing around the lanes of Stonnall, and subsequently reader and local history author Clive Roberts found the above 2007 video of Brian Crighton preparing a bike to race. Brian is by all accounts a genius and a gentleman to boot. Clive, who’s long been a biker and admirer of Brain, recently sent me the below scans of an article which appeared in the December 2006 issue of Classic Bike magazine, detailing a new bike with a rotary engine that Brian had built. Since the video is in 2007, is it possibly the bike or a variant thereof detailed here? I’ve machine-transcribed the text below for those who find reading the scan difficult. Thanks to Clive for an otherwise bit of unnoticed and offbeat local history – and I hear Clive is working on another book about local pub history, which will be out in time for Christmas – I look forward to reading that. If anyone knows what happened to Brian’s bike project, and what he is doing now, I’d love to know, and I’m sure readers would too. Please get in touch – comment here or mail me: BrownhillsBob at Googlemail dot com. Thanks. White text on black? Ugh. I’ve transcribed below to save your eyes, but click for a larger version. Norton’s winning rotary racers were outlawed by rule changes before engineer Brian Crighton had achance to create his ultimate version. 12 years later and the bike is ready for testing. Forget new models from Yamaha, Honda and Suzuki, the surprise star of the NEC bike show, tucked away on the Dunlop tyres stand, was a stunning new Norton rotary race bike. Back in 1994 Brian Crighton was at the top of the game. The Duckhams Norton Wankels that he tuned and prepared dominated that year’s HEAT Supercup championship, with Ian Simpson winning the title and Phil Borley finishing third. And Brian had a new design on the drawing board for 1995. Unfortunately that new design remained a dream for the next 12 years. Norton’s Shenstone factory had ceased production and had no hope of meeting Superbike racing homologation rules for 1995. The eerie sound of the flame-spitting Wankel racers, that had dominated British racing for five years, fell silent and Brian was out of a job. In 2003 things looked up. National Motorcycle Museum owner Roy Richards, a lifelong Norton enthusiast, had bought every factory Rotary racer he could find. Who better than Brian Crighton, the man who had instigated the racer project in 1987, to get them back into trackworthy condition. And what about the 1995 bike? The new bike was finally unveiled at the NEC bike show in October. Both Crighton andRichards are understandably cagey about committing to a racing schedule for the untested bike. The prospect of a Norton competing in the Isle of Man on the 100th anniversary of the first TT (the first TT was won by a Norton) is something that every Norton enthusiast or TT race fan would want to see. And hear. Brian runs a bike up at Mallory Park in 2007. Roy Richards was bowled over when he first set eyes on the machine shortly before the show: “What a magnificent piece of work! When God made the mountains he had Norton in mind and we are now sitting on the very pinnacle.” he said. It is a stunner. The colour scheme harks back to Norton’s glory days of the Thirties and Forties, but under the paint this is a modern racer. Some Nineties features remain, notably the Spondon aluminium frame. It still has a braced two-sided swingarm, but now controlled by one shock rather than two. The twin rotor engine’s porting and 10:1 compression ratio are unchanged from 1994 but it is surrounded by new kit. The NRV’s key component is a programmable engine control unit (ECU) which co­ordinates various functions including fuel injection, ignition timing and throttle operation. The 36mm injector intakes are under the bulge at the front of the fuel tank. Their butterfly throttles are turned by an electric motor, responding to signals the ‘fly by wire’ twistgrip sends to the ECU via a potentiometer worked by cables. An electric pump in the tank forces fuel to nozzles aimed directly into the intakes, while a ram air duct in the fairing nose supplies air. Brian uses variable tract induction, seen on some production car engines and Yamaha’s 2007 YZF-R1. His hand-built system has telescopic intake tracts and a linear servo motor from a bank cash machine. “The tracts shorten when the engine reaches 8000rpm to keep torque at a maximum all the way to 11,000rpm. Torque gives you acceleration without the need for high revs,” he explains. The on-board ECU is an off-the-peg Omex unit. Readily programmed from a laptop, it runs GEMS software and links both with a 2D data-logging unit and an LED dash panel. ECU-governed ignition timing is referenced from a timing wheel on the engine mainshaft, the two plugs being fired by separate coils. Electric power comes from 12v metal hydride batteries, charged by a Yamaha R6 race kit generator. The old Rotary’s exhaust extractor to draw cooling air through the engine is replaced by a more controllable electric fan in the outlet duct behind the seat. The main water-cooling system has an ECU-linked electric pump. Primary drive is by belt, to a Yamaha based six-speed gearbox. A Kawasaki-sourced slipper clutch copes with engine braking effects. Brian’s next tasks are dyno and track shakedown tests. Steve Spray, UK Fl champion on a Norton Rotary in 1989, has agreed to ride in track demos next year, but some serious racing is also planned. The Norton cannot meet production-based Superbike rules but could contest open 1000cc or 1300cc classes. At the Show, TT officials said they’d like to see the machine contest the 2007 Senior race. 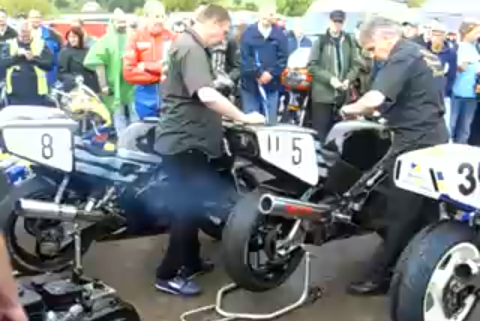 Wherever the Norton NRV588 does race, Brian believes it will put up a good show. This entry was posted in Environment, Events, Followups, Fun stuff to see and do, Interesting photos, Local History, Local media, News, Reader enquiries, Shared media, Shared memories, Social Media, Spotted whilst browsing the web, Walsall community, Walsall Wood stuff and tagged 2006, 2007, 80's, bike, Brian Crighton, Brownhills, Brownhills local history, Classic bike, Clive Roberts, Events, Film, footage, Honda Shop, Lichfield, Local History, Mallory Park, Motorcycle, Shire Oak, Silver Court, Staffordshire, Things to do, Triumphman7. Bookmark the permalink. Never forget early one sunday morning in the late 80s I was at the traffic lights on the A5 waiting to turn right into Whitehorse Road when to my left two JPS Nortons pulled up.They looked to be fully race prepped bikes and both riders were wearing full race black leathers.As the lights changed to green both Nortons accelerated away up onto the back wheel and disappeared out of sight down towards the Rising Sun island.By the time I had regained my composure the traffic lights had turned to red again leaving me still sat there on my 250 Honda Superdream.No names on the back of the riders leathers but I still wonder to this day if it was Steve Spray and Trevor Nation off out for a quick test ride ? Hello Ade. Back in the 1970s I remember seeing the wankle nortons going through Clayhanger, the bikes looked standard, but the norton badge was painted out, what made me look twice was the sound of the bike. that’s no four stroke! Now, can I place an order for Clive’s forthcoming book, please? What a smashing article. My first “go” at riding was on a Tiger Cub..around the perimeter of Walsall Wood football field.Triumph were THE dream machine …better than Harleys, especially round bends! Can I place an advance order for Clives new book! Hello Dave. ok mate your on the list. I was at Mallory Park on the day in question, it was a privilege to witness the Rotary’s being fettled before the on track demonstration of high speed mock racing. With so many machines taking part the sound was unbelievable. The success of the project is remarkable as the engine was unconventional the budget was small and the attitude of the officials accepting rotary engines always threatening to ban them. The win in the TT was immense given that Japanese companies used all their resources to gain top results, The Norton came out top after a long high speed race thanks to the efforts of a Brownhills man overcoming every problem on the day. I hope Brian continues to innovate for many years to come.